Paid search marketing means you advertise within the sponsored listings of a search engine or a partner site bypaying either each time your ad is clicked (pay-per-click – PPC) or less commonly, when your ad is displayed (cost-per-impression – CPM). It’s a lot to wade through. 1. Competition. Since Pay Per Click has become popular due to its effectiveness, it is competitive and because it is based on competitive bids it can get expensive. CPC/bid inflation has led to some companies reducing PPC activity. Some companies may get involved in bidding wars that drive bids up to an unacceptable-level “some phrases such as ‘life insurance’ may exceed £10 per click. 4. Complexity of managing large campaigns. 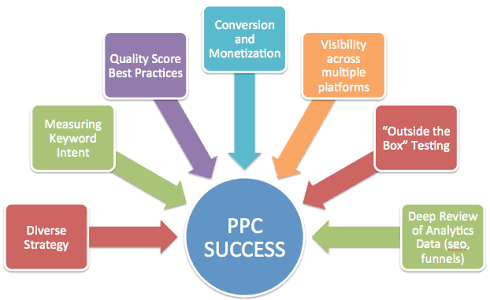 PPC is deceptively simple to setup. But to compete effectively, particularly for a large campaign, requires knowledge of best practice which changes as Google and other engines introduce new facilities – see the official update blogs from the search networks to gain an idea. Use negative keywords to your advantage: Negative keywordsenable you to filter out search terms that aren’t relevant to your products and services, so your ads won’t show up for those irrelevant searches. In the long run, this can save you a lot of money in wasteful clicks! Don’t go too broad: It’s also worth paying special attention to the long tail of search—that is, the longer, less frequent keyword phrases that actually add up to a greater volume of visits than the few most common keywords. Long-tail keywords tend to show a high degree of intent, so they can be excellent candidates for your paid search campaigns. For example, it’s a good bet that someone who searches on “organic dog food free shipping” is later in the buying cycle than someone who searches on “dog food” alone. 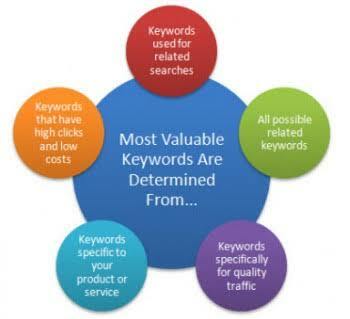 Bidding on the right keywords is only part of the paid search marketing battle. You also need to create relevant, compelling text ads. This will ensure that your ad shows up in the first place—kind of important!—but also that search engine users are drawn in to click. A high click-through rate (CTR) makes for more cost-effective paid search campaigns. You’ll lower your cost per click while improving Quality Score and earning better ad positions. Highly relevant to the user’s search query. Be sure your ad addresses the query directly and leads the user to an appropriate landing page on your website. For instance, if the keyword is “natural dog food,” use those specific words in the ad and don’t lead the searcher to a general pet food page. Eye-catching without being spammy. Include a call to action(entice them to buy your product or sign up for a free trial, for example) but don’t use all caps, multiple exclamation points or phrases like “Click here.” Such tomfoolery is better suited to the comments fields of political blogs. The AdWords Performance Grader’s expert analysis shows you where and how to make improvements that will improve your performance and save you money. Following PPC best practices have never been easier – it’s fast, secure, and free. What are the drawbacks with using Google AdWords? Google updated AdWords in February with Enhanced Campaigns. This means advertisers can now target people based on time of day, location and the device they’re using. Unfortunately advertisers can no longer run tablet only campaigns, as Google ‘believes’ tablets perform exactly the same as desktop devices. You can increase or decrease separate bids for mobile and desktop, but no longer for tablets. Adwords’ nearest rival is the Yahoo Bing Network (YBN). It claims to be a ‘combined advertising marketplace’ made up of Yahoo, Bing and many syndicated partners such as Facebook, Amazon and Monster. Worldwide there are 489m unique searchers on the YBN, 94m of who don’t use Google. These searchers spend 137% more than the average searcher and 76% more than Google searchers worldwide. YBN isn’t suggesting you need to run campaigns on Google AND its own network, its suggesting that you run your campaigns solely on its network because users spend more money there. In fact 9.5% of the financial service companies who used both AdWords and YBN achieved higher click-through-rates (CTRs) on YBN. 5.7% of companies in the shopping category who used both search engines also had higher CTRs. These aren’t exactly mind-blowing stats, but it does prove that there is justification in weighing up whether to advertise on either or both. The most important positive here isyour company’s appearance at the top of the SERPs. With organic results decreasing rapidly further down the screen, it’s vital that your company appears within the top five results in order to stand a chance of click-through. If you know your way around the platform, you can set up a PPC campaign in less than an hour, and appear immediately in the sponsored results. You can do things organically. If you run a small business, that either has a tight marketing budget or if you just don’t want to jump into bed with the major search engines, you can still do many things to raise your profile and compete with the big brands. Check out this success story involving the London restaurant Hawksmoor and the future of small business. How transparent is the bidding process?How do companies know that the money they’re spending is worth their while? Is this just done with trial and error, with companies raising their maximum bids incrementally than checking the SERP to see how they’re doing? What about non-ecommerce sites? Is there anything stopping me from spending loads of money trying to raise the profile of my own music blog by bidding on ‘new music reviews’? Does this seem perhaps underhanded, is the integrity of my non-ecommerce site more important than traffic? Previous Post Brand Niche Marketing & Strategies. Next Post Contextual Marketing -How An Advertise Is Next To Your Digital Steps? One question I would answer, is that click fraud is very prevalent in today’s SEM space and in digital marketing altogether. Some digital media companies can experience up to 40% in ad fraud. The client’s click through might look good, but once they dig into their Analytics, they will see all sorts of traffic on their site for 1 second, coming from Siberia, Russia. This means no ROI, and a wasted ad budget. It is important (for any size business) to have a trusted partner to help manage these campaigns. Adwords is a full time job, and typical users who can set up a campaign, cannot properly manage it. Click fraud “bots” can change on a daily basis, so having a partner who has capabilities and the tool set to put these IP’s on a blocking list (blacklist), or identify them as spam is highly recommended, opposed to going at it alone. You will spend money in a management fee, but I promise it will be less than if you try to run your business and do Adwords by yourself.